As every public historian knows, our training has ruined museums for us. Even when we’re just visiting a museum for fun, we find ourselves considering how the exhibits are arranged, examining how artifacts are mounted, analyzing the font size and layout of labels, and critically evaluating the interpretation. The critic that we spend so much time cultivating in graduate school sometimes blinds us to the real power of museums. But every once in a while, we encounter something special that captures our imagination and helps us to see museums with fresh eyes. While in Washington D.C. this summer, a fellow Loyola public history graduate and I ventured out to the National Air and Space Museum Udvar-Hazy Center in Chantilly, Virginia. We were prepared for a fun day of looking at cool airplanes and analyzing the museum’s interpretation. Having been to numerous aviation museums across the country, my inner critic was eager to see how the Smithsonian’s effort compared. As we walked around talking about airplanes and critiquing label copy, I suddenly stopped. Didn’t I just see something familiar? We ran back to the World War II section, and there it was: a bomber jacket with my grandpa’s squadron patch on it. I’d seen patch a thousand times, framed with my grandpa’s medals on the wall at my grandparents’ house in Washington State. But what was it doing here? The only label for the artifact indicated that it was donated by Russell Paulnock. Clearly I would have to find out more. I did some research when I got home and made some interesting discoveries. My grandpa, Anthony Lauby, and Russell Paulnock both served in the 18th Bomb Squadron of the 34th Bomb Group in the 8thAir Force during World War II. Grandpa enlisted in the Army Air Force in August, 1941 and became an aircraft mechanic, rising to the rank of Master Sergeant. 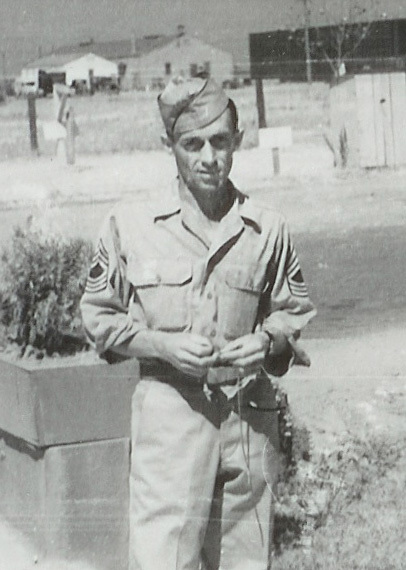 Paulnock enlisted in the Army Air Force in November, 1941 and became a bomber pilot, attaining at least the rank of Second Lieutenant. Both men trained with the 34thbomb group in Blythe, California before going overseas to Mendlesham, England in 1944. While in England, Paulnock piloted the B-24 “Belle of the Brawl,” and my grandpa was a crew chief overseeing the maintenance and repair of B-17s and B-24s. I can’t ask grandpa if he knew Russell Paulnock, because, like an increasing number of World War II veterans, he is no longer around to ask. But maybe he worked on “Belle of the Brawl,” and maybe he even saw Paulnock in the same jacket that I stumbled upon almost 70 years later and a world away. Overall, my friend and I enjoyed our time at the National Air and Space Museum. 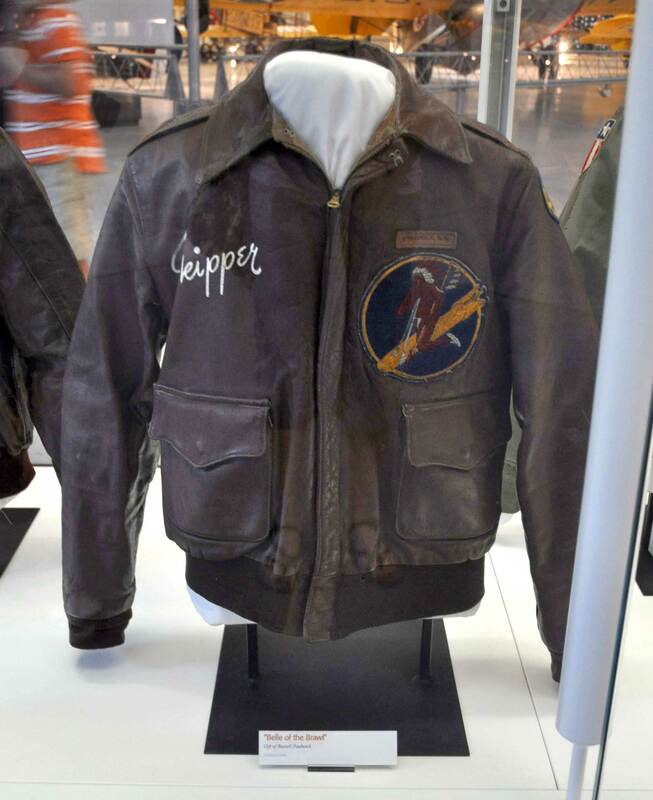 The chance encounter with Paulnock’s bomber jacket enabled us to step outside our analytical headspace and see the artifacts in the museum with a sense of wonder, reminding us of the power of museums to connect visitors to the past. Great story! But don’t you say that our training ruins the experience, I would say that “reinvigorates” it. You probably already know but for those that don’t, Pritzker Military Library has a bunch of stuff (3-D objects including clothing, medals, weapons, and even a GI Joe collection of medal of honor recipients!) from WWII available to researchers. ahh he was my uncle ( russell) great to see this he was very proud to donate his jacket. My father is Russell Paulnock. He is no longer with us but he would have been pleased to read your story about seeing his jacket at the Smithsonian.